It was in 1950 that then director of NBC’s opera programming, Peter Herman Adler, commissioned composer Gian-Carlo Menotti (1911 – 2007) to compose the first ever opera for the American television audience. This was no easy task and it is one of the many credits due to the exceptional talent of Menotti that he made the decision to compose an opera for the child, for the faiths, in all of us. First Broadcast on NBC, Christmas Eve 1951, the opera has become not just a holiday favorite, but one of the most often performed operas in the world. It is, in the canon of opera, a very short piece of only fifty minutes in length. Menotti was inspired, it is said, by Bosch’s “The Adoration of the Magi” which is shown in New York’s Metropolitan Museum of Art. One November afternoon as I was walking rather gloomily through the rooms of the Metropolitan Museum, I chanced to stop in front of the Adoration of the Kings by Hieronymus Bosch, and as I was looking at it, suddenly I heard again, coming from the distant blue hills, the weird song of the Three Kings. I then realized they had come back to me and had brought me a gift. I clearly recall holidays of the past when our family would gather to watch this always magical story unfold before us. The story is timeless; a widow with a troubled crippled child is visited by three wealthy night visitors as they make their way following a certain star in the East. Everyone is forever changed by the time they share within the walls of a humble shelter. The lessons this opera teaches are numerous; humility, generosity, love, community and faith are but a few. The story encompasses so many of the basic tenants of all faiths and, in those terms, is a gift for all. A link to the entire digital conversion of that 1951 performance, including an introduction by the composer himself is provided below. As we experience yet another holiday season, it is my hope that this gorgeous music, the story of forgiveness and miracles will further enrich your season, regardless of location, faithful belief or language. Take the time to experience this incredible story. It’s only fifty minutes long – and it may change your life. For those more musically inclined, the link below provides the entire score of the opera. As I write this article, I am sitting in a small hotel in the village of Vocogno di Craveggia (VB) in the Valle Vigezzo of northern Italy. Located a mere two hours by train from the intensive noise and traffic of Milano, you will find peace, quite, tranquility and rest in this lovely area of Italia. Frequented by Italian and Swiss travelers, this particular valley has been overlooked by all but knowledgeable international visitors for centuries. The Vigezzo river valley meanders through the Lapontine Alps in Italy, bordering the Swiss Canton of Ticino on its northern perimiter. It is known, among other things, for its annual celebration of the chimney-sweepers, “spazzacamini” in Italian. Each September, the village fills with those who come to honor this special and much honored traditional work. The buildings here are mostly stone and stucco. Granite and slate roofs top barns and homes and the sense of this place is as much Switzerland as it is Italy. The Hotel La Perla occupies a marvelous site above the village. Mattei, the owner, or his son Francesco, offer to pick you up (and return you at the conclusion of your visit) in Santa Maria Maggiore. The hotel is located some distance, uphill, from the station so this is a much appreciated service. Without a car, you should plan to walk; special requests for pick-up and drop off can be made with the owners. The three-star hotel La Perla offers very simple, clean, uncluttered rooms. If you ask for a mountain/valley view you will not be disappointed. Some rooms on the second and third floors offer terraces and stunning vistas of the valley and villages below. Don’t expect fancy; expect clean, friendly and well-managed accommodation. The restaurant in the hotel offers memorable meals. Dinner last evening was a Caprese salad, followed by some baked potato gnocchi prepared with a special regional cheese. The sliced local beef was beautifully prepared with some patate fritte to accompany the secondo. Francesco, the son of the owners, is the chef. His capabilities are more than evident in a flavorful and well-prepared “cena” (dinner). The restaurant also offers a good selection of local and regional wines. The views from the dining room are spectacular, as well. Your days here can be filled with rented electric bicycles, hikes in the foothills of the alps, easy strolls through the valley villages. Not unlike the Cinque Terre on the Ligurian coast of Italy, the chain of small towns are linked by the “Centovalli Vigezzina“, known locally as the Centovalli train. You can purchase tickets to/from various villages and walk back or just enjoy time in each one, returning to Santa Maria Maggiore at the end of an easy day. (Click on the map for easier reading). Be sure to plan a few days in this region of Italy. Hotels are not plentiful, so reservations are strongly recommended. Most accommodations are three-star with a few four-star available. If your time in Italy is limited, you might enjoy the full day excursion known as the Lago Maggiore Express. Our blog article provides details and information. Trenitalia offers regular service from all over Italy to Milano Centrale and from there on to Domodossola, the last large city before entering Switzerland. Those coming from Brig, in Switzerland, will find trains available on either the Italiarail or Swiss Bundesbahn web sites. From Domodossola, you can purchase tickets for the Centovalli train (though online purchases in advance are recommend, as this will guarantee you seats especially during the busiest months of August, September, Christmas Holiday, January and February). The news came quietly. The art world was stunned to learn that a fresco in the church of Santa Maria in Marcialla, not far from Florence, had been attributed to none other than Michelangelo. 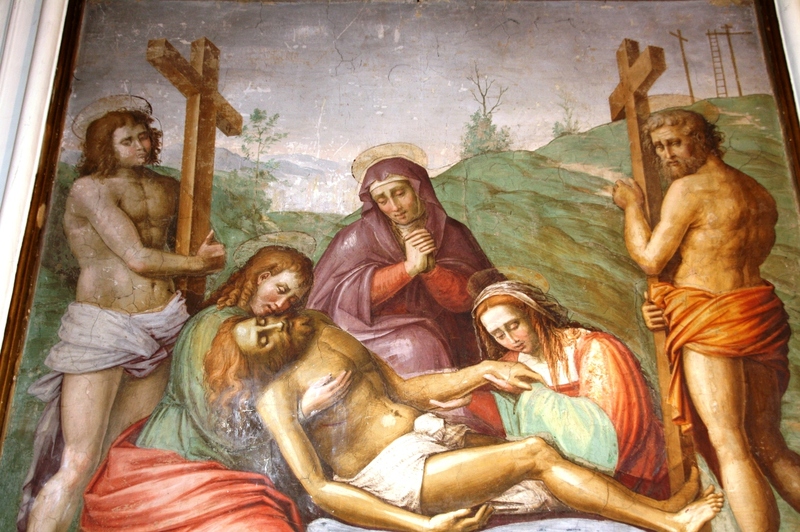 Residents of Marcialla, a tiny village south of Florence, have for generations claimed that a fresco depicting the deposition of Christ in their local parish church of Santa Maria was done by Michelangelo. After dedicated study by numerous art experts and historians, the attribution is official; Michelangelo, along with the probable assistance of two of the artists friends-Granacci and Bugiardini-created the fresco. It was the two associates intervention, as well as some more recent overpainting, that complicated and delayed the attribution. One of the most important pieces of evidence to support the attribution is the discovery of initials behind the altar facade in the church’s side chapel. The initials, MBF, had been hidden for centuries. The letters stand for, it is believed, Michelangelo Buonarotti Fecit – or Michelangelo Buonarotti Fiorentino (Michelangelo Buonarotti did this or Michelangelo Buonarotti of Florence). Additional evidence that this is Michelangelo’s work is supported by the fact that the letters “M” and “B” were the same as those the artist painted above a crucifix in the church of Santo Spirito in Florence. 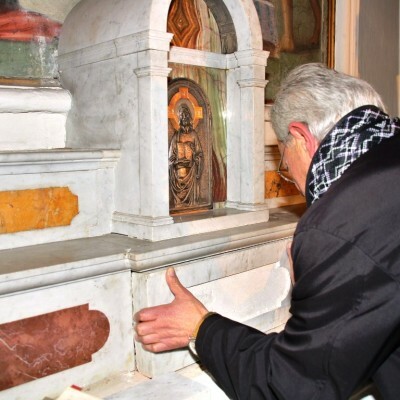 The local parish priest, Father Rosario Palumbo, went to Dottoressa Elsa Masi, a local resident and retired chemist, to share with her that he had overheard a parishioner talk about seeing the initials behind the chapel’s altar stone many years prior during a youthful prank. Dottoressa Masi has lead efforts to achieve formal attribution of the fresco, regardless of final result. She reached out to the expert Renaissance art history community to have this important piece of news investigated. There are further data points to confirm Michelangelo’s hand; in the winter of 1494, the artist sought refuge with the Augustinian monks who lived and worked in the Marcialla church and monastery. The Medici had been ousted from Florence, thanks to the ‘mad monk of Ferrara’, Domenico Savonarola. 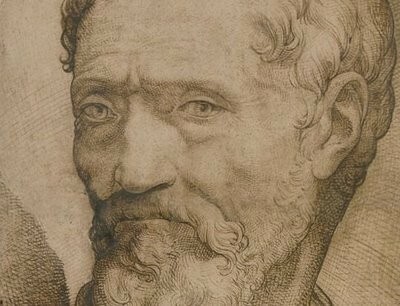 In order to avoid being caught up in the political and social turmoil surrounding anyone associated with the Medici, Michelangelo fled. The fresco may have been created as a way of thanking the Augustinian monks for their hospitality and protection. The Order would later support Michelangelo’s anatomical studies in underground rooms beneath the Basilica of Santa Croce in Florence. 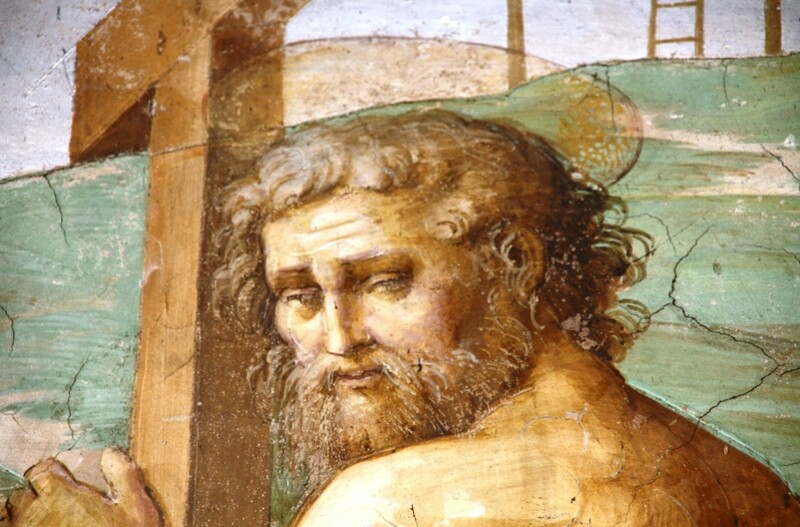 The figure on the right in the fresco, a muscular bearded man, is conjectured to be Michelangelo’s imaginative interpretation of his own face in older age. When compared to the face of Nicodemus in the artist’s sculpture of the Pieta, now displayed in Florence’s Museum of the Works of the Duomo, as well as numerous etchings and paintings of the artist in his old age, there are certainly arguments to be made. The triangular form of the the main figures in the fresco are known to have been favored by the artist. Additionally, and not unknown in Michelangelo’s work, Joseph, the father of Christ, is not depicted in the fresco. Professor Robert Weiss, in his 1942 book The Renaissance Discovery of Classical Antiquity (1969), made the assertion that the fresco was Michelangelo’s. Then, the fresco slipped back in to its quiet corner of a small church in rural Tuscany-until now. After years of tireless work, the art’s community has made it official: Michelangelo is the artist who created the fresco. It is always a surprise and a stunning statement about hidden treasures of art, to learn of yet another masterpiece by a Renaissance genius on the side altar of a small church, in a small village, in the hills of Tuscany. The village of Marcialla is located about forty minutes south/southwest of Florence. The fact that this lovely village is ‘off the map’ of the heavy tourist traffic makes it all the more enticing as a day excursion destination. Please call the church office before visiting. You will need to confirm that the church is open for visitors. See also our previous blog post, Villa Demidoff with further details and information about this incredible estate. During your time at the park, you can visit places of interest like the Buontalenti Chapel, the Sala Rossa, the Grotto of Cupid and the Fagianeria. Please note that these visits require prior reservation and payment. See “Opening Hours” listed below in this article. The access to the park is allowed only on foot and you can leave your car in the free public parking in front of the main entrance. Inside the park you can find toilet facilities, a playground area for children , free wifi and a restaurant and coffee bar service. If you’re driving, head to Piazza della Libertà; once there, follow road signs to “Ponterosso – Via Bolognese” and drive away from the city. Via Bolognese, also the SS65 road, leads you out of Florence through Pian di S. Bartolo and Montorsoli to arrive in Pratolino. You’ll see a parking lot on the left as you arrive in Pratolino, turn and park there – the entrance to the park is right across the road. Take the ATAF bus #25A from Piazza San Marco – the “A” is important because otherwise you’ll not get to Pratolino. The #25 stops before the Demidoff Park; the 25A gets you to the a stop just above the park entrance. You can easily walk back down the incline to the park entrance. of the property. SITA also offers service to Pratolino from the main stop at the Santa Maria Novella Train Station with stop on Via Nazionale in Florence. The ATAF bus stop in Pratolino is a little beyond the park entrance but it isn’t far to walk back toward the park.